If you’ve followed me for a while, you may be familiar with my story. If you aren’t, you can read it here. It’s a high level summary of my personal journey to good health. But I’d like to get a little more personal. In my next few blog posts I’ll be digging in a little deeper by sharing the nitty gritty details of my journey that has led me to where I am today. Joined Gold’s Gym and sign-up on a whim to work with a personal trainer. Could not even do half of a push-up in my first session. Complained a lot during my personal training sessions (because it’s hard!) but secretly started loving it! Still working with my personal trainer. Lost more weight than I ever expected. Personal trainer tells me, “Weight loss is simple. Burn more calories out than you take calories in.” This resonates. So I start going to the gym more often and start working out on my own without him! Personal trainer leaves the gym but I continue to train wit him - at home, at the park, high school track, etc. Personal trainer makes me start running at the high school track. I want to die. Discovered Lean Cuisines and think they’re the greatest thing since slice bread. Quick, “healthy” food option! Took a break from personal training and started going to group exercises classes at the gym. Started running more - with co-workers and friends. The stairmill (the one where the stairs move) becomes my new best friend. A regular at the 6 am bootcamp / Body Pump group classes at the gym. A regular at the evening Body Pump / Body Combat group classes at the gym. Started a new job with management that leads by intimidation - extremely stressful. Added a third daily workout with lunchtime yoga to combat work stress. Stressed out trying to fit all my workouts in, get to them in time so I could be front and center (yes I was “that” person), pack necessary gear and eat enough food for fuel. Trained for and completed my first half marathon. Continued three-a-day workouts and all the stress and logistical coordination that went along with it. Trained for and completed my second and third half marathons, plus many shorter races. Discovered a whole running community on social media (Twitter). Made friends with amazing runners who run marathons! Signed up to run my first marathon! Trained for eight marathons, finished four marathons. Resumed personal training with personal trainer. Always injured (trained through pain). Thousands of dollars spent on chiropractic treatments, acupuncture, massages, running clinics, etc. In the span of just nine years I went from couch potato to running over a thousand miles per year. But by the time I started training for the San Francisco Marathon in 2013, my body did not love running. It had been trying to tell me to take it easy for years, but I chose to ignore it. Until it screamed so loud I no longer could. 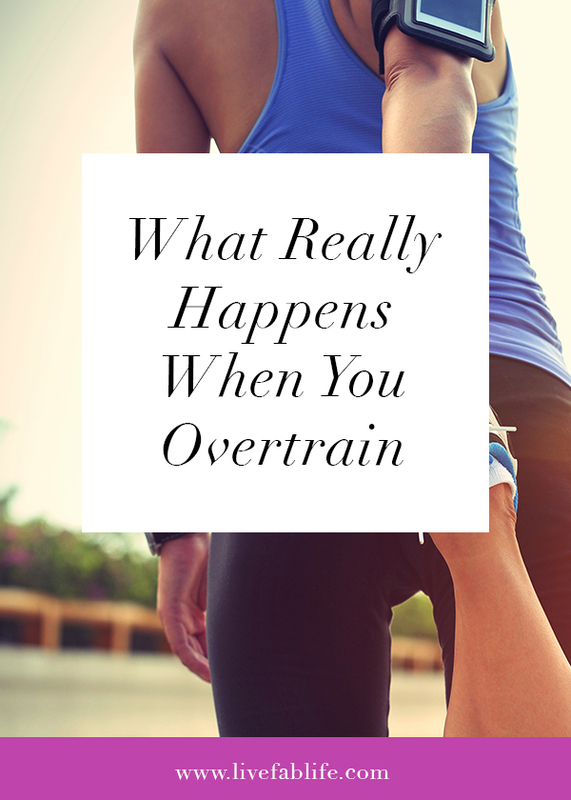 What Really Happens When You Overtrain? Every athlete has heard of overtraining. A simple Google search will pull up endless articles from publications like Runner’s World, Men’s Health, etc with articles explaining what is overtraining and what the classic signs are. They give you advice like, “take rest days”, “run easy” and “get more sleep.” All great advice, but what happens when you don’t listen to them? That, my friend, is what I’m sharing with you. And looking back, my body started telling me that I was overtraining way back in 2008. I hadn’t even started running races then. But I was doing three-a-day workouts, two of which were high intensity workouts. There I was, dedicating my life to fitness, counting every calorie I ate and yet I didn’t lose a pound. I wasn’t gaining any weight (that didn’t come until I started running), but I wasn’t losing any either. It was about this time (2008), that my trainer suggested I start eating “caveman” style. What he meant was follow a Paleo diet, but the Paleo craze was just starting and I didn’t know what it was called. He told me to “simply” stop eating foods that weren’t around in caveman days. Translation: stop eating processed foods. I ate this way for a few months, snacking on hard boiled eggs and nuts. But I felt deprived. And I still wasn’t losing weight so I ended that experiment. When I started running races at the end of 2008, my weight started to creep up. Here I was, running dozens of miles each week, for hours at a time, still counting calories and yet I was gaining weight? I didn’t get it. So my trainer suggested I cut out gluten. This advice did helped me. I started sleeping better and my oily, acne complexion cleared up. But still gained weight. I’m a runner and have IBS so I’m not embarrassed to talk about poop. The gut is the “second brain” of the human body and your poop tells you A LOT about your health. So it’s something I'm comfortable talking about. And I had all the symptoms - especially while training. It’s common for a runner to experience “runners trot.” But, runners trot is not a healthy norm and it is a huge red flag. Your body is telling you that something is wrong. It’s experiencing more stress than it can handle and it's telling you that you need to tone things down. I started experiencing while training for my first marathon in 2010. At the time I didn’t know it wasn’t normal and chose to ignore it because it happens to every runner, right?! I mentioned in this post how journaling helped me identify causes for my poor sleep. Work stress was definitely a source, but so was marathon training. I see so many runners complain about insomnia, and rightfully so. I mean, if you’re running dozens and dozens of miles a week, shouldn’t you feel tired and able to sleep? If you’re not, that is your body telling you that something is not right. It might be your blood sugar, or your cortisol levels. Or something else. I finally admitted that something was not right when I had intense leg pains after running just a few miles. Of course, at first I tried to run through it. But they were debilitating. I couldn’t even run a mile without being in complete pain and feeling exhausted. It wasn’t an “I’m injured” kind of pain, it was just pain that hurt when I moved. I had many long runs cut short. I'd sit on a bench in Golden Gate Park in tears feeling like a failure and not a “real” runner. Non-physical symptoms I also experienced were depression, not “feeling like myself” and brain fog. I was going out of mind trying to figure out what was going on. I had friends who were seeing functional medicine doctors for unrelated reasons. They suggested that I start seeing one to so I did. Functional medicine probes and investigates to find out the root causes of illnesses. It doesn’t just treat symptoms and prescribe medication to relieve immediate pain. I saw my functional medicine doctor for 18 months. Health insurance did not cover this. It was definitely an investment in my health. But it was also well worth it. Through many lab tests I learned of the many food sensitivities that I have. Eating those foods was a source of stress for my body. Adrenal Fatigue happens when your stress levels are high. Your body isn’t able to produce hormones to deal with it. It creates a hormonal imbalance. By 2013 my work situation had changed. I had a new role and wasn't stressed anymore. My home life was good. So it was easy to zero in on the main source of stress in my life - my active fitness lifestyle. It was too much over a prolonged period of time and my body couldn’t take it anymore. I ignored it for as long as I could, but when your legs stop working, there’s no way to keep “fighting” through it. Once I knew what I was dealing with, the logical thing to do would have been to stop working out so much, right? But I wasn’t getting better. I wanted to know how long I had to “take it easy” before I could start training again. So I scoured the internet. I searched terms like, “how long does it take to recover from adrenal fatigue.” And guess what - I couldn’t find a single source with THE answer. Why? Because no two people are the same. I had to learn the hard way, through much trial and error, that you can’t recover while still training. It took me months to “get” this. It’s now been over two years and I’m still trying to figure out what my threshold is. How much is too much, and how much is not enough? I share this with you NOT to say that marathon and endurance training is bad. Some people have no problem with it (and I am so envious of them!). Bioindividuality applies not just to food and diet, but to exercise too. What works for one may not work for someone else. But I hope that if you are fighting through any type of symptoms or feeling "off" you take a moment to look at your situation holistically. If there are messages your body is trying to tell you, please be kind to it and listen. I finally had to accept the fact that endurance training does not work for me - at least for right now. Will it in the future? I have no idea. I hope so, but it may not. And I’m okay with that. Sort of. I am learning what kinds of exercises works for my body. For now it’s Pilates, HIIT workouts and strength exercises. I may not feel the rush of a Finish Line, but I do feel a sense of accomplishment when I’m able to complete a move that’s taken me months to learn.